Well it is April and Saturday’s weather was just what I needed to say, “enough with the fur, wool, down coats and other winter clothing. I am ready to break out my spring wardrobe”. What are the new trends out there? It is up to me as your style resource to fill you in. And for those that have been with me for a while, you know I always say that “trends are suggestions and not mandates”. I supply the information, you make the decisions. How does that sound? The new hottest theme for spring is utility. This includes tops and bottoms with various cargo pockets, as well as straps, tabs and belts. The boiler suit is the newest jumpsuit. Leather is all over the place for spring, both in traditional neutrals and more spring-like colors. Crochet and netting are used in dresses, tops and dusters. Arts & crafty clothing continue the boho vibe. Feathers and fringe are still popular adornments. Re-worked versions of denim continue with patchwork, fraying, new washes and more. Easily wearable pieces include pleated skirts, cardigans and paper-bag waist pants. After all this athleisiure (which is still strong), there is a return to more structured suiting and sophistication. However, the bike short is back. Joggers and baggy denim are some of the new casual looks. As always, trenches show up for spring. Tech-y fabrics like parachute materials are the new casual versions of light weight outerwear. Head to toe tan / beige neutrals are a thing; great for the classic minded and now it is trendy. On the flip side of the coin, vibrant colors are also a thing. Brightly colored suiting or just a bright item paired back to a neutral. Living Coral is the color of the year. Bright yellow is also a huge color trend. One of the biggest patterns of the season is the bandanna print, including more multi-colored versions of paisley prints and scarf prints with panels and borders. Tie-dye is back. Mixing prints and patterns in one garment continue. Gingham and tropical will be favorites in the true summer months. The slide is still in, but flip-flops have made a return. The white flat tennis sneaker such as Stan Smith’s have been rampant. These continue, but the new trendy sneaker is now the clunky trainer sneaker. For those who like comfort the sporty sandals are in. The dressy - sexier sandal is the floss strap sandals. And for fun, try a sculptured heel or printed shoe. Click on the image to shop these styles. Hair accessories are big this season, especially fun barrettes and stuffed fabric headbands. Seashells adorn everything from shoes, to bags to jewelry. Mico bags and super over-sized totes are both new. Top handle bags, belt bags and chain straps continues. 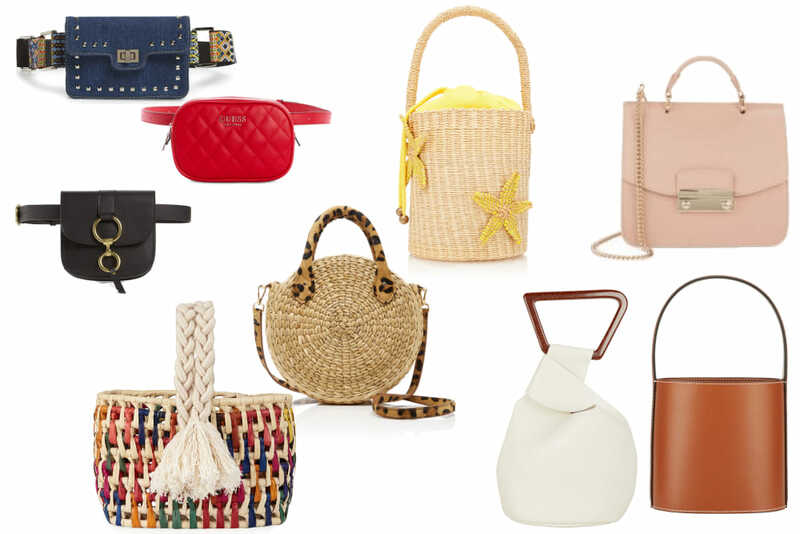 Try a straw bag for summer. That is a wrap for your overview of some of the many trends this season. If you need help shopping for anything, just let me know.